Exterior: 17-inch alloy wheels (19-inch on higher grade models), electrically adjustable/folding and heated door mirrors, privacy glass, automatic windsreen wipers, automatic headlights, daytime running lights and rear LED lights. Interior & Tech: Premium cloth upholstery or leather on higher grade models, front and rear electric windows, dual zone climate control, 8-inch infotainment system with CD/DAB radio, sat nav, Bluetooth, USB (in front and rear), AUX, steering wheel mounted controls, electronic parking brake, radar cruise control and engine stop/start button. Safety: Advanced Smart City Brake Support, drive auto-door locking, blind spot monitorting (with cross traffic alert), lane keep assistant, curtain, dual front and side air bags, dynamic stability control with traction control system, emergency stop signalling system, hill hold assist, intelligent speed assist, ISOFIX child seat fittings, immobiliser and tyre pressure moniitoring. 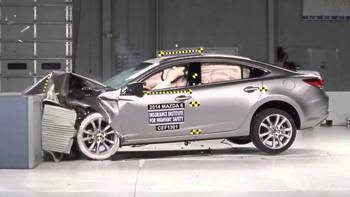 The Mazda 6 saloon and tourer scored the maximum five stars in NCAP safety tests. The scores are for adult occupant protection (95%), child occupant protection (91%), safety assist systems (73%) and vulnerable road users (66%). Standard safety features include: Advanced Smart City Brake Support, Auto door locking on drive away, Blind Spot Monitoring system with Rear Cross Traffic Alert, Curtain airbags, Dual front and side airbags, Dynamic Stability Control (DSC) with Traction Control System (TCS), Emergency Stop Signalling system, Hill Hold Assist, Intelligent speed assist, ISOFIX child seat anchorages, Lane Keep Assist System, Thatcham Category 1 alarm and immobiliser and Tyre Pressure Monitoring System. Mazda’s SKYACTIV system combines clever technogy like cylinder de-activation with light build materials that do not compromise safety or quality. The end result is larger engines that match or better the efficiency of many of their smaller rivals. Entry-level models have the option of the 2.0 litre (145PS) SKYACTIV-G petrol engine or the 2.2 litre (150PS) SKYACTIV-D diesel engine, both are available with either 6-speed manual or automatic transmission. The 2.2 (150PS) diesel with manual transmission offers the lowest running costs with a combined fuel efficiency of up to 55pmg and CO2 emissions of 117g/km. Higher grade models have the option of a more powerful 165PS petrol engine with manual transmission or a 184PS diesel (available with manual or automatic transmission). The newest edition to the engine line-up is a 2.5 litre (194PS) petrol engine (currently only available with automatic transmission and on the top-grade GT Sport Nav model), the 2.5 petrol models are fairly nippy (0-62mph in 8.1 seonds). The 184PS diesel is a great option offering decent acceleration (0-62mph in 8.5 seconds) whilst still delivering excellent running costs (combined fuel economy is up to 53mpg and CO2 enmissions are 124g/km. The new Mazda 6 is spacious inside and features a great blend of practicality with excellent quality materials. Entry-level models feature premium cloth upholstery whilst higher-grade models have black leather or premium nappa leather interior with the option of stone nappa leather on the top-grade model. Other features include front and rear electric windows, dual zone climate control, leather covered steering wheel and gear knob, scuff plates and auto-dimming rear view mirror. In the rear you get a center console/armrest which includes two cupholders and two handy USB ports. The New Mazda 6 available in saloon or tourer (estate) models, features a striking, muscular/low profile design that Mazda descibe as their 'KODO: Soul of Motion Design'. All models feature privacy glass, black front grille (gunmetal on top grade models), daytime running lights, rear lower bumper extension, rear LED lights and electrically-adjustable and heated power folding door mirrors with integrated indicators. Lower grade models are equipped with 17-inch alloy wheels whilst higher grade models include 19-inch alloy wheels. 33 Mazda 6 are available at UK Car Discount! Click here to see our Mazda 6 offers.